"Charlie McCarthy" redirects here. For other uses, see Charlie McCarthy (disambiguation). Bergen was born in Chicago, Illinois, one of five children and the youngest of two sons of Swedish immigrants Nilla Svensdotter (née Osberg) and Johan Henriksson Berggren. He lived on a farm near Decatur, Michigan until he was 4 when his family returned to Sweden where he learned the language. He taught himself ventriloquism from a pamphlet called "The Wizard's Manual" when he was 11 after his family returned to Chicago. He attended Lake View High School. After his father died when he was just 16, he went out to work as an apprentice accountant, a furnace stoke, a player piano operator, and a projectionist in a silent-movie house. 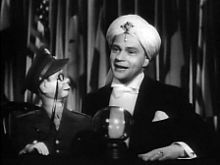 The famous ventriloquist Harry Lester was so impressed by Edgar that he gave the teenager almost daily lessons for three months in the fundamentals of ventriloquism. In the fall of 1919, Edgar paid Chicago woodcarver Theodore Mack $36 to sculpt a likeness of a rascally red-headed Irish newspaperboy he knew. The head went on a dummy named Charlie McCarthy, which became Bergen's lifelong sidekick. He had created the body himself, using a nine-inch length of broomstick for the backbone, and rubber bands and cords to control the lower jaw mechanism of the mouth. For college he attended Northwestern University where he was enrolled in the pre-med program to please his mother. He switched to Speech & Drama but never completed his degree. He gave his first public performance at Waveland Avenue Congregational Church located on the northeast corner of Waveland and Janssen. He lived across the street from the church. In 1965, he gave the church a generous contribution, a thoughtful letter, and a photograph of himself which had been requested by the minister and was displayed in the church's assembly room which was dedicated to Bergen. He cut out an "R" and a "G" from his family name and went from Berggren to Bergen on the showbills. Between June 1922 and August 1925, he performed every summer on the professional Chautauqua circuit and at the Lyceum theater in Chicago. Bergen had an interest in aviation, becoming a private pilot. In 1941, Bergen met 19-year-old Frances Westerman, who had graduated from Los Angeles High School the year before, in the audience of Bergen's radio program as the guest of a member of his staff. Sitting in the front row, the young fashion model's legs caught 38-year-old Bergen's attention and he asked to meet her. The two were married in Mexico after years of long-distance courtship, on June 28, 1945. On May 9, 1946 Frances gave birth to future actress Candice Bergen, whose first performances were on Bergen's radio show. Their second child was film and television editor Kris Bergen. Frances also acted, appearing in several movies, co-starring in the 1958 television series Yancy Derringer, and guest-starring in numerous other shows. In mid-September 1978 he announced that he was retiring after over 50 years in show business and sending his monocled, top-hatted partner, Charlie McCarthy, to the National Museum of American History at the Smithsonian Institution in Washington, D.C.. He opened at Caesar's Palace Hotel Las Vegas on September 27, for a two-week "Farewell to show business" engagement. He died three days later on September 30, 1978. Bergen was interred with his parents (who are buried under their true surname of "Berggren"), in Inglewood Park Cemetery, Inglewood, California. Edgar Bergen's wife of 33 years, Frances Westerman Bergen, died at Cedars-Sinai Medical Center in Los Angeles, on October 2, 2006, aged 84, from undisclosed causes. She is also buried in Inglewood Cemetery. In 1990, Bergen was elected to the Radio Hall of Fame, the same year that The Charlie McCarthy Show was selected as an honored program. A message in the closing credits dedicates The Muppet Movie (which featured Edgar and Charlie in their last screen appearance) to the memory and magic of Edgar. In 1991, the United States Postal Service honored him with a 29-cent commemorative stamp. Wikimedia Commons has media related to Edgar Bergen.